BVI will be a great place to be this summer. We have evening and Saturday classes from June 23rd through August 2nd much like our academy year schedule. When you register, you can pick the weeks you want to attend or you can do all six. 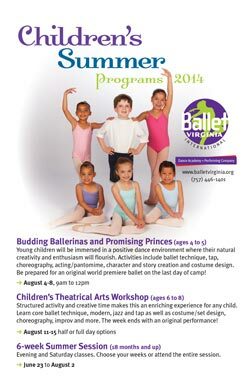 In August, BVI focuses on age appropriate workshops and intensives. Each weekly session is packed with activity that is geared to the ages and levels of the participating dancers. We find that without the school year academic demands, our dancers are able to really focus both physically and mentally on their dance training. Just like you keep your child reading in the summer, we hope that you keep your child dancing in the summer. Summer Dance Programs Are you going away to study?